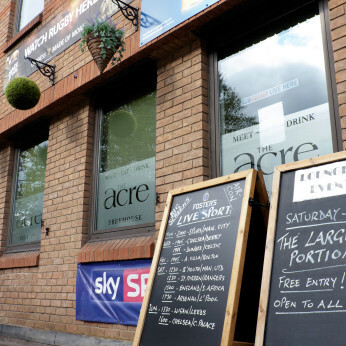 The Acre (incorporating the Windsor & District Liberal Club) is everything you would expect from a 'proper' town centre pub! We show all the live sport action from Sky and BT Sports on large screens in both the Lounge Bar and Cellar Bar. Darts and other traditional pub games are always available. We serve cask ales (Cask Marque accredited), international beers, superb wines, freshly made coffee from our Barista coffee machine and just about every spirit and soft drink you could ask for! We have live bands in the Lounge every Saturday night with the emphasis on Rock and Pop. Meanwhile in the Cellar Bar we host regular Blues and Jazz acts. If you need to hire a room for a private function our Cellar Bar is the ideal place and usually free to hire! We also have a Meeting Room which is available to hire and seats up to 20 people. Although we don't serve food customers are encouraged to eat their take-aways here and enjoy it in comfortable surroundings. Cutlery and crockery provided by us. And we are listed in The Good Beer Guide 2019. Due to popular demand here is a list of Music Events booked up to the end of March. Watch out for a new list for the remainder of the year which will be published later this month. Sat 9 Mar - T. Roze & Co.